Colloquially described as “Iceland in Miniature” due to its diverse array of natural attractions, the Snæfellsnes Peninsula is one of the most beautiful and easily accessed regions in the country. But just what is there to see and do on the Snæfellsnes Peninsula, and what are the different accommodation options that exist there? Jutting out from Iceland’s western side like a pincer, the Snæfellsnes Peninsula is among the most visited regions in the country, offering strapped-for-time guests the opportunity to see much of what makes Iceland special in one single day. Snæfellsnes is known for its ancient sea cliffs, glittering waterfalls and mountain gorges, its jagged coastlines, quaint meadows, and dramatic mountainscapes. And that’s not even mentioning its namesake, the domineering Snæfellsjökull glacier. Wikimedia. Creative Commons. Credit: Axel Kristinsson. The misty and mighty Snæfellsjökull glacier towers over the peninsula from the tip, in constant sight as one drives through rolling farmlands, volcanic fields and quaint fishing villages. It is the embodiment of its mythical inhabitant, Bárður, the guardian spirit of the peninsula, as foretold in the ancient Viking Sagas, and serves as a constant reminder as to just how ancient, primordial and haunting Snæfellsnes really is. The 700,000-year-old stratovolcano Snæfellsjökull is, quite naturally, a popular spot for glacier hiking, offering not only a closer insight into the intricate landscapes of a glacier but also panoramic views of the surrounding peninsula. Its importance and omnipresence in the region is the leading factor as to why a national park—named after the said ice cap—was established in 2001 as a means of protecting the region’s diverse landscape, including its distinctive flora and fauna. Today, the national park covers a total area of 170 km² (65 sq. miles). Fans of literature will also recognise Snæfellsjökull glacier from Jules Verne’s Journey to the Centre of the Earth, as the plotlines’ entrance point to a fantastical subterranean universe. Of course, Snæfellsjökull glacier is not the only attraction worthy of attention in the region. 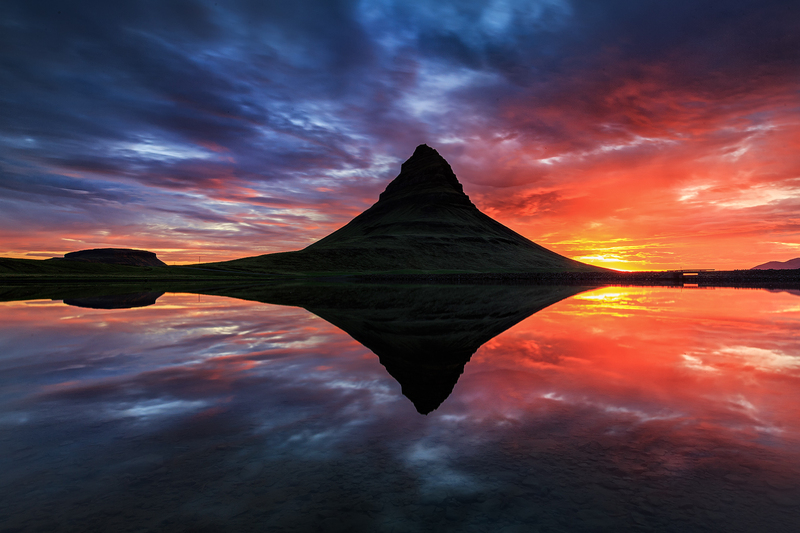 Within the national park’s borders sits the mountain, Kirkjufell, a particularly notable feature for two major reasons; this Iceland’s ‘most photographed mountain’ is the town landmark of Grundarfjörður, and it served as a backdrop in HBO’s epic fantasy series, Game of Thrones. Fans of the show will recognise it as “the mountain like an arrowhead”, as described by The Hound, as well as the setting for where the Children of the Forest first created the demonic White Walkers. Across the road, one can find the mountain’s waterfall, Kirkjufellsfoss, a particularly pleasant feature that compliments almost all photographs of Kirkjufell. Parking at the site is limited, but those able to snag a spot can spend time walking around the falls, taking in the fantastic, overhanging cliff sides and wide panoramas of the Atlantic. Standing there, you’ll have little doubt as to why Kirkjufell is such an iconic shooting location for film and television production crews worldwide. But what of a place to stay close by? Well, accommodation options in the area include such properties as the picturesque and unforgettable Snaefellsnes Cottage, located only ten minutes from the village of Hellissandur. This particularly aesthetic holiday home includes two bedrooms, a sleeping loft, all of your basic amenities and views overlooking the glacier. At the tip of the peninsula are two volcanic craters, both of which sit at the foot of Snæfellsjökull. The first, Saxhóll, has a metal staircase that winds all of the way to the crater’s lip, roughly 100 metres up, whereas Hólahólar—in truth, a series of craters—can be located further to the south. Both of these are worthy of a visit due simply to the insight they provide into just how violent, catastrophic and influential Snæfellsjökull past eruptions have been—after all, the dried and expansive lava fields that make the peninsula so unique are a direct consequence of this geological action. This is but the beginning of what the peninsula offers. Curved like an arch, the black sand bay of Djúpalónssandur can be best described by its evocative, freestanding lava pillars, grassy embankments and as the location of the four famed lifting stones; Amlóði (‘useless’), Hálfdrættingur (‘weakling’), Hálfsterkur (‘half-strong’) and Fullsterkur (‘full-strong’). These stones, ranging in weight, were used as a measure of strength for local fishermen, and visitors are welcome to test their own mettle upon arrival. Aside from that, guests will also see firsthand the remains of a perished ship that litters the shoreline. Wikimedia. Creative Commons. Credit: Michael Clarke stuff. A little further south along the coast, one will find the geological marvel, Vatnshellir. Vatnshellir cave is an 8000-year-old lava tube, hidden away 32 metres below ground level. Nothing can describe the feeling of awe that comes with standing in this labyrinthine underworld, complete with its cragged, naturally-formed rock sculptures and vibrant, glowing bacterium. Note that this cave can only be visited with the guidance of professionals, of which tours can be found here. Continuing in a southeasterly direction, Lóndrangar are two rock pinnacles located along the coastline, towering over its flat, surrounding scenery. As one of the optimum spots for birdwatching in the country, twitchers here can catch a glimpse of black crested kittiwakes, skuas and even Atlantic Puffin, depending on the season. Standing on the cliffside in full view of Lóndrangar, it is easy to see why the Icelandic people are so taken with the idea that this island’s natural landscape is alive, breathing almost—the rock pinnacles appear as two frozen trolls, ‘freezing’ being the common fate when a troll is subject to sunlight. Two towns on the Snæfellsnes Peninsula’s southern tip are Hellnar and Arnarstapi, between those sits a popular hiking route along bird cliffs, an established nature reserve since 1979. Both of these towns sit adjacent to the south of Snæfellsjökull National Park and can be passed on a circular route around the peninsula. Historically one of the largest villages on the peninsula, Hellnar is now most famous for the dramatic rock-arch, Gatklettur, a favourite amongst visiting photographers, as well as the strange cove, Baðstofa, known for its mesmerising light patterns and colour. Arnarstapi, on the other hand, is widely regarded for its large Arctic Tern population and its historical relevance as one of the region’s more rambunctious trading posts—Arnarstapi once boasted a far larger population, whereas today, the village possesses only a few year-round inhabitants. A number of different accommodation choices can be found in this westernmost area of Snæfellsnes, though the most popular vacation site is a cabin complex off Hellnar, including the three cottages Garðabúð, Arabúð and Þórubúð. With 200-300 metres separating the cabins, each boasts stunning 360-degree views of both Snæfellsjökull and the ocean, three bedrooms and all the amenities a small family or travelling party could ever ask for. But what lies further along the peninsula? For starters, Rauðfeldsgjá is a cliffside gorge with a gentle stream running through, and provides an excellent example of just how intricate and hidden away Iceland’s canyons can be. Visitors will notice a small car park as the circle the tip of the peninsula, from which a mere five minutes stroll leads to the gorge entrance. Beware for those who enter; the stream can, at times, can quite deep, meaning wet shoes should come as a surprise for nobody. Bjarnarfoss is one of the peninsula’s most visited waterfalls. Glittering glacial water plummets from the lip of a mountain into a clear pool below, providing a captivating subject for photographers and nature-lovers alike. Rivalling the likes of Seljalandsfoss and even Dettifoss for beauty, Bjarnarfoss will sometimes disappear completely in strong winds. Even so, folklore dictates that this gorgeous attraction is sometimes home to a fairy queen, though you may be hard pressed in finding her. Ytri-Tunga is one of the best white sand beaches on the peninsula to watch seals basking on the rocks, providing a close up look at some of Iceland’s most beloved wildlife species. The different species of seal that call Icelandic coastal waters their home include the likes of the common seal, grey seal, ringed seal, harp seal, bearded seal and the hooded seal. Iceland has even known to have wild Walrus from time to time, though this is a much rarer encounter. Heading north again on Road 56, you will find yourself heading towards the village of Stykkishólmur, known to international audiences as one of the staple locations in the Ben Stiller vehicle, ‘The Secret Life of Walter Mitty’ (2013). This quaint and traditional Icelandic settlement is home to Iceland’s first two-story building, originally constructed as a family home, and the haunting wreckage of a German freighter, washed up on the town’s shoreline. Stykkishólmur makes for a fantastic spot to try out some open sea kayaking tours, during which guests can see the wreck up close, alongside many of the region’s small islands and a variety of birdlife. Those looking for something a little different during their stay on the peninsula could check out the following listings—this Stykkishólmur Apartment comes with 1 bedroom, sofa bed and free wifi, as well as easy access to the town’s local supermarket, swimming pool and other amenities, while the instantly recognisable, 1904-built Hamar cottage boasts a wide open living space, four bedrooms and BBQ facilities. Whatever you choose for accommodation, visiting the Snæfellsnes Peninsula is a must for guests to Iceland, even those with only a few days to spare. As with most regions, guests can choose to either drive the peninsula themselves or partake in a guided tour by minibus or Superjeep. Whatever one chooses, Snæfellsnes is not a region that you’re likely to forget in a hurry with its hypnotising landscapes, awe-inspiring geological features and fascinating link to Icelandic folklore and history. We hope this article on Snæfellsnes peninsula is helpful for your interest in in the region and can help you planning for future travels in Iceland. If you have any questions then please leave a comment below and answer as soon as possible.